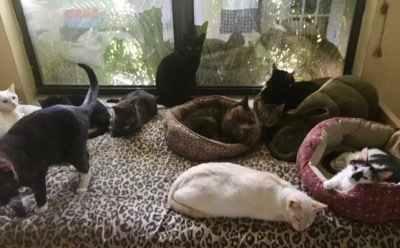 Abandoned and abused cats find a second chance in life at this amazing animal sanctuary in South Florida. Angelico Cat and Dog Rescue allows all rescues freedom to roam indoors and outdoors, there is an amazing peaceful catio that connects directly to the house where the cats can hang out, watch the birds and feel safe. Click here to see another paw-some cat sanctuary that looks like a permanent holiday!